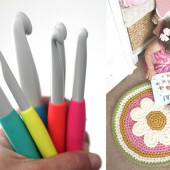 A few weeks ago I got a fun e-mail in my inbox from Yarnspirations featuring their new Foodie Baby Lookbook. 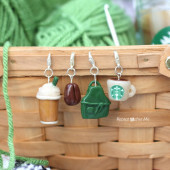 I was so excited to see all the adorable food-inspired crochet patterns! 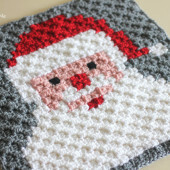 If I had more time I would crochet all of them but the one I really loved was the How About The Apples Blanket! It a fun corner-to-corner design with red apples with one apple that has been eaten down to the core. As I was about to get this project on my hook, I just happen scrolled through the Five A Day Knit Cardigan and noticed the pattern included 3 SUPER CUTE pixel graphs: An Avocado, Watermelon Slice, and Apple. I couldn’t resist the watermelon graph and decided to make a blanket (similar to How Bout The Apples) but with watermelon slices! I love the way these watermelon slices look when crocheted corner-to-corner! I originally crocheted the seeds as well (chain 4, slip stitch in 2nd chain from hook, SC in next, HDC + SC in last) but then I decided it was easier to just use a tapestry needle and long piece of black yarn to stitch the seeds on. I stitched the squares together with my tapestry needle and long strand of yarn using the mattress stitch. Then I crocheted a border of SC stitches. 3 rounds of natural color, 3 rounds of magenta, one round of green, and then one more round of green using the reverse SC stitch. Always be sure to make a SC + chain 2 + SC in your corners! I’ve already seen a few of you making other things with these cute foodie graphs like pillows! Now I’m tempted to make myself an avocado pillow! Remember you can find these pixel graphs in the Five a Day Knit Cardigan Pattern from the Yarnspirations Foodie Baby Lookbook. I also recommend you browse this adorable free lookbook for tons of inspiration and fun food-themed patterns! Be sure to tag me on social media using the hashtag #RepeatCrafterMe and #Yarnspirations if you make this project! please i want to see the tutorial and want to publish at Eduzaurus.com so that my viewer give a good respond and incline in traffic. Gorgeous project, my dear, I love both, colors and stitches. Thank so much for sharing the pattern with all of us. This one is going to my “To Do List”, that’s for sure! And also I’d like to include this project (one picture plus link) in my next “Summer Round-Up post” that I’m going to publish in my blog today. Have a lovely Sunday, dear! This is gorgeous – you are very talented! I can’t see you mention how much yarn was required? 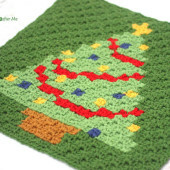 I am thinking of making this in a bigger size and would be very grateful if you could tell me how much yarn is needed for squares and border so I can calculate what I would need (though I have a feeling it might get a bit expensive ). I am thinking of doing 3×3 or 3×4 squares.